When it comes to skincare, you’ll often hear people say: “don’t use what everyone else’s using, use what’s right for your skin type”. But, in this article, I’m telling you quite the opposite. I’m saying: use what everyone else’s using (the Kiehl’s Ultra Facial collection) because it’s right for your skin. There’s so much skincare available right now that skincare shopping is somewhat of a mission (which is fitting, because the Ultra Facial range actually went on a mission of its own, but more on that later). This vast array of skincare on offer got me thinking: wouldn’t it be easier if there was one range that worked for everyone? Swapping out certain products to suit the skin’s needs? Well, you guessed it, there is. 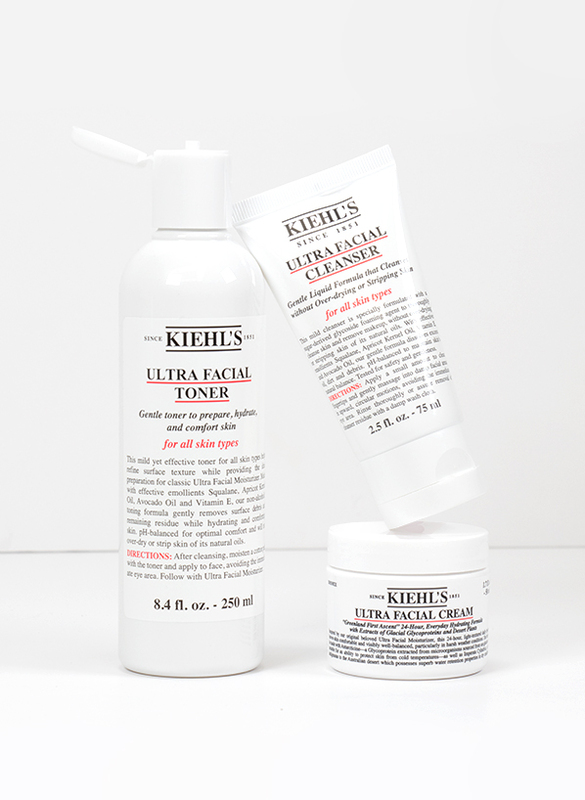 Kiehl’s Ultra Facial is made for all. With a focus on achieving healthy, hydrated skin there’s no skin type that couldn’t benefit from it. What’s Special About Ultra Facial? Many of you reading this may have already heard of the best-selling product in this collection: the Kiehl’s Ultra Facial Cream. And there’s no doubt about it, this hero moisturiser is an icon, but the rest of the range is worth knowing about too! Ultra Facial is a skincare treasure trove. There’s everything from moisturisers and cleansers to lotions and masks, all of which can be mixed and matched to create a tailor-made routine for every skin type. What makes Ultra Facial different to other skincare collections is its focus on hydration, which is important for skin health no matter whether your skin is super oily or extremely dry. And replenishing ingredients like squalane and imperata cylindrica are to thank for Ultra Facial’s skin-quenching action. Formulas so good that they’ve even been tested in the most extreme conditions, accompanying explorers to ice-covered peaks in 2005’s ‘Greenland First Ascent’. It’s safe to say that this range is up to any task! My skin isn’t just dry; it’s sandpaper dry. If you’ve ever suffered from ultra-parched skin you’ll know what I mean! My complexion is so tight and rough that it often borders on painful (especially on my forehead for some reason), so I’m forever looking for skincare that won’t just intensely moisturise, it’ll also provide some relief. Oh, and dare I say it, actually make my skin look healthy again! My top tip for others in the same boat is to find a routine you love and stick to it, which is just what I’ve been doing for the past week. I already know and love the iconic Ultra Facial Cream, but this week I’ve swapped it out for the Kiehl’s Ultra Facial Deep Moisture Balm and I’ve been getting some amazing results. The thicker, more buttery texture of the balm creates an immediate ‘cushion’ of moisture for my skin and leaves an ultra-light film on its surface, which may not be for everyone, but dry skin types will adore the extra nourishment. This smoothing film creates the perfect base for makeup, too, especially if you find that your base products get patchy throughout the day because your skin is on the rough side. It’s fair to say that the Ultra Facial Deep Moisture Balm has been a bit of a revelation for me. 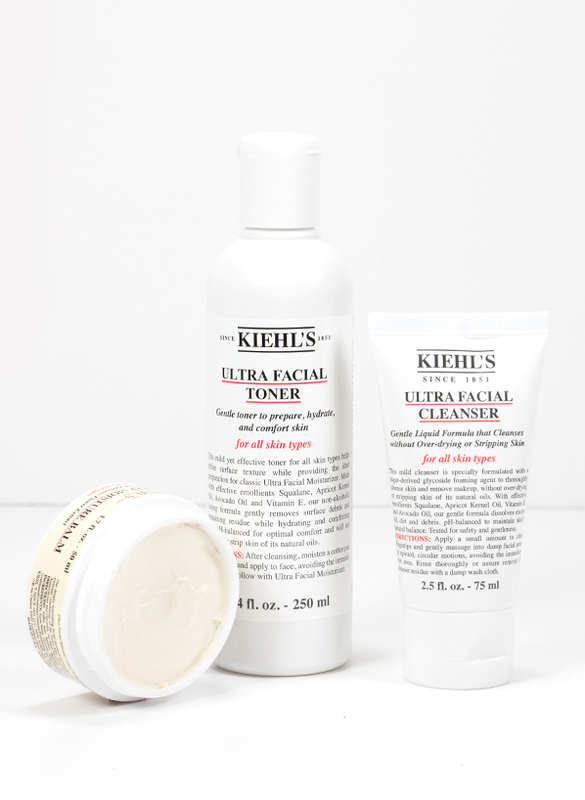 To complement my new favourite product, I’ve also been using the Kiehl’s Ultra Facial Cleanser. The light-as-air gel cleanser has actually gotten me back at the bathroom sink and away from the micellar waters for a hot minute; I normally prefer a water-free cleanse for my reactive skin, but this pared-back, gentle formula has taken the sting out of cleansing my face. I gently massage it onto my damp skin to loosen impurities, then I wet a cloth and wipe the day away. I then add some extra comfort before the moisturising step with the Kiehl’s Ultra Facial Toner, which is the most un-toner-like toner I think I’ve ever used. It’s a moisturising formula that sandwiches skin with emollient squalane, avocado oil, apricot kernel oil and vitamin E, and it prepares my skin beautifully for the moisture balm. If you’re looking for a skincare routine that’ll not only work with your dry skin to provide comfort, but also help to bring your skin’s healthy glow back, this is it. It goes without saying that my combination skin is somewhat fickle, so if there’s one thing I try to do it’s keep my skincare routine as regimented as possible. So, with that in mind, if I’m testing out products I’m extremely dedicated. For the last week, I have used nothing but Ultra Facial, morning and night, which was a little daunting for me as I have never used anything from Kiehl’s – a shameful admission from a self-proclaimed skincare addict I know. My routine for the last 7 days has included these products: the Kiehl’s Ultra Facial Cleanser, Kiehl’s Ultra Facial Toner and last but certainly not least the Kiehl’s Ultra Facial Cream. 3 products? I’m just as shocked as you are. So, how did I get on… Firstly, let’s chat the Ultra Facial Cleanser. This cleanser is so gentle, yet so effective. Because my skin can change from one day to the next I found this formula was a great fit for me; super milky and gentle, so great when my skin was feeling dry, but also purifying (without stripping moisture), which I need when my skin’s leaning towards the oily side. The second step in my Ultra Facial routine is the Ultra Facial Toner; a step I don’t always remember usually I’ll admit, but I’ve actually really enjoyed it this past week and my skin’s loved it too! This toner is more like a booster in my eyes, and it really suits my combination skin’s needs. Not only did it make sure all dirt and makeup were banished from my complexion but it also nourished with its water-like texture that’s packed full of amazing ingredients like vitamin E, apricot kernel oil and avocado oil. You may think this is a fussy extra step, but I think the extra cleanse really pays off. The last product and my favourite of the bunch is the Ultra Facial Cream. I’ve heard so many people rave about this so I couldn’t wait to get stuck into the pot. One of my main worries was that the formula would be too rich for my skin and make me break out, but luckily, it didn’t! Better yet, the super lavish texture made a great base for my makeup and did amazing things for my skin’s appearance. Even on no makeup days, my skin radiated health, looked plump and felt super comfortable. A 7-day trial wasn’t enough for me, I’m keeping Ultra Facial around indefinitely! There’s no point beating around the bush, my skin is oily. Really oily. Because of this, I’m always testing the latest skincare products for oily skin types. I couldn’t even begin to tell you how many I’ve tried! So, when I realised Ultra Facial had an oil-free section to their Ultra Facial range I was intrigued and so ready to get testing. When I’m trying a skincare collection I normally like to test the waters before diving into a full routine (I don’t want to freak my skin out), so I opted to try the Kiehl’s Ultra Facial Oil-Free Cleanser because every oily skin needs a great cleanser and the Kiehl’s Ultra Facial Oil-Free Gel Cream, which I chose because it’s texture looked super refreshing! 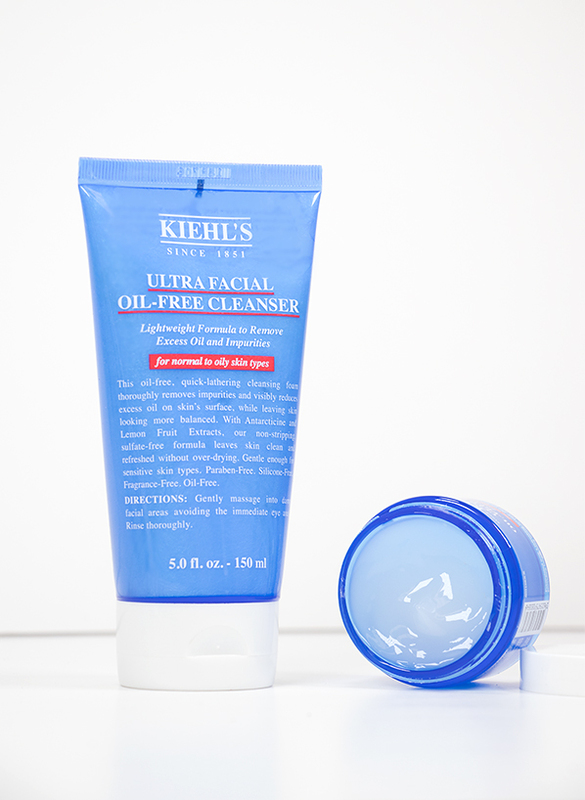 My thoughts on the Kiehl’s Ultra Facial Oil-Free Cleanser are simple: it’s really lovely! The formula is extremely gentle, it left my skin feeling really clean but not at all stripped or dry and additions like Amazonian white clay and aloe vera really helped clear up my complexion over the course of the week. Moisturiser for many is a simple tick box for hydration. But for me, I want hydration, a good base for my makeup, and if it can help with my oily skin too then I’m sold. Safe to say that the Kiehl’s Ultra Facial Oil-Free Gel Cream had a lot to live up to. And I was pleasantly surprised, the gel-cream moisturiser fitted into my routine really easily and worked wonders under my foundation (I’m a Double Wear girl), my skin felt super smooth, comfortable and I’d say it did help keep shine at bay slightly too. Overall, I’d say it’s a great pick for someone that doesn’t want to overload their oily skin, but still has hydration high on their priorities. This entry was posted on Thursday, November 1st, 2018 at 9:39 am and is filed under Skincare, Spotlight On, Tried & Tested. You can follow any responses to this entry through the RSS 2.0 feed. You can skip to the end and leave a response. Pinging is currently not allowed.